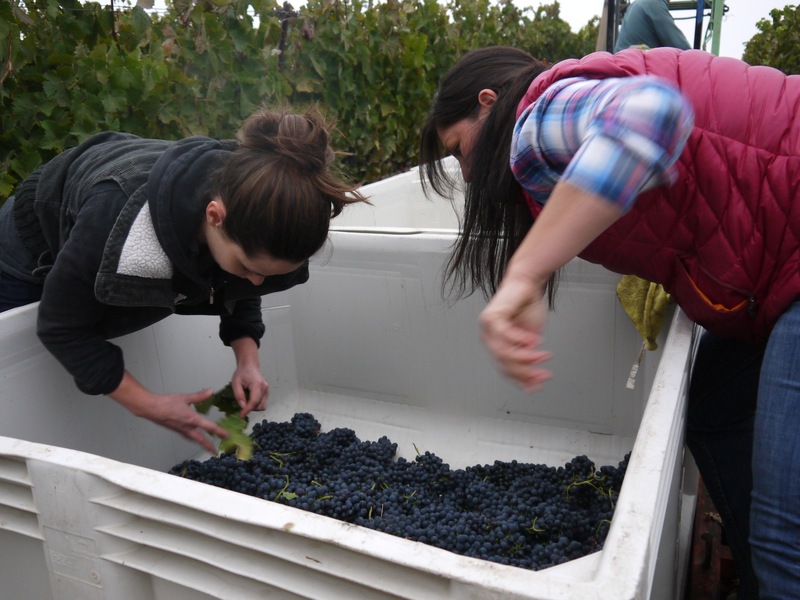 Harvest Tales: Winemaking partners turn dreams into business with Dreamcôte Wine Co.
Winemaking partners Anna Clifford and Brittany Tanquary Zotovich started harvest 2014 in thick early morning fog one week ago, Aug. 29, at McGinley Vineyard. This site, in Happy Canyon of Santa Barbara, is the grape source for their label, Dreamcôte Wine Co., and its 2014 Syrah, which Clifford and Zotovich will make utilizing carbonic maceration, commonly known as the Beaujolais style. In 2013, their second vintage of Dreamcôte, the women sourced pinot noir from Duvarita Vineyard outside Lompoc and crafted a light, fruity wine meant to drink sooner, not later. Fermented in a stainless steel tank, that wine is “gulp-able now (not next year),” according to the label’s tasting notes. And that’s exactly the duo’s plan again this vintage, but with the McGinley syrah. After spending one dinner and a morning both at McGinley and in the Terravant Wine Company cellar with these bright, determined and fun-loving women, I’d say the web description is apt. Cowboy boots are perfect picking attire. Just ask Brittany Zotovich. The two met at Terravant, where both work fulltime: Clifford as a winemaker and Zotovich as director of sales: winery accounts. Curious about the inner workings of Terravant, I ask her for more details. In an e-mail, Zotovich replied: “Terravant connects customers with grapes, grape crush services, bulk wines, wine finishing and bottling services, small-lot bottled wines, customized wine program sourcing, custom grape-to-bottle and bulk-to-bottle programs, as well as all-inclusive, tailored private labels. Zotovich, who radiates passion for wine and life in general, also really likes her job. Zotovich was born in Santa Clara, and raised in Grass Valley. In 2007, she earned a degree in Agricultural Business: International Management, with a minor in wine and viticulture, from Cal Poly. She started working at Kelsey See Canyon under Harold Osborne, and for Salisbury Vineyards, when she was just 19. In 2010, Zotovich joined the winery owned by the family of the man she would later marry. There, at Zotovich Cellars, she helped open its Lompoc Ghetto tasting room, and launched the wine club and sales program. In July 2011, Brittany Tanquary married Ryan Zotovich, also a Cal Poly graduate and the Zotovich Cellars’ winemaker. With his family, he also oversees Zotovich Family Vineyard, located in the heart of the Sta. Rita Hills. The vineyard is a source of viognier, chardonnay, syrah and pinot noir for the Zotovich label and many others. Clifford, a native of Thousand Oaks, recalled being just 13 when she decided to become a winemaker. She credits a movie, “French Kiss,” the quirky comedy-romance starring Meg Ryan and Kevin Kline that was filmed in and around vineyards in France. However, “for me, it wasn’t about the romance, but the wine and vineyards,” she said. Fast forward to 2002, when Clifford graduated from UC Davis with a degree in viticulture and enology. Her winemaking career includes a stint as assistant winemaker for Buena Vista Winery, three harvests in New Zealand and one at Beringer Vineyards. 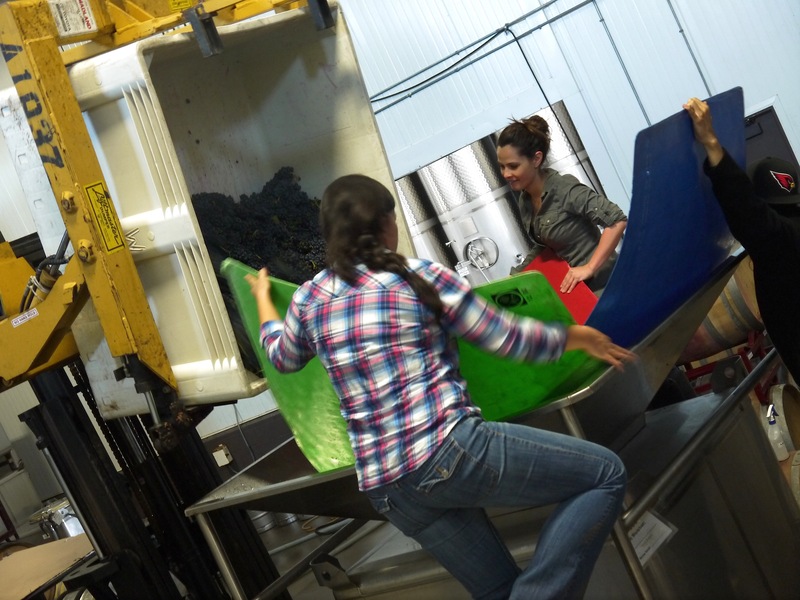 In April 2012, she started at Terravant, and today, with two others, shares winemaking responsibilities for the entire facility. In other words — fruit forward and fun, ideal to “drink with friends, at a barbecue,” she said. Part of Dreamcôte’s “drink me now” presentation is Clifford and Zotovich’s use of whimsical labels that prompt smiles. 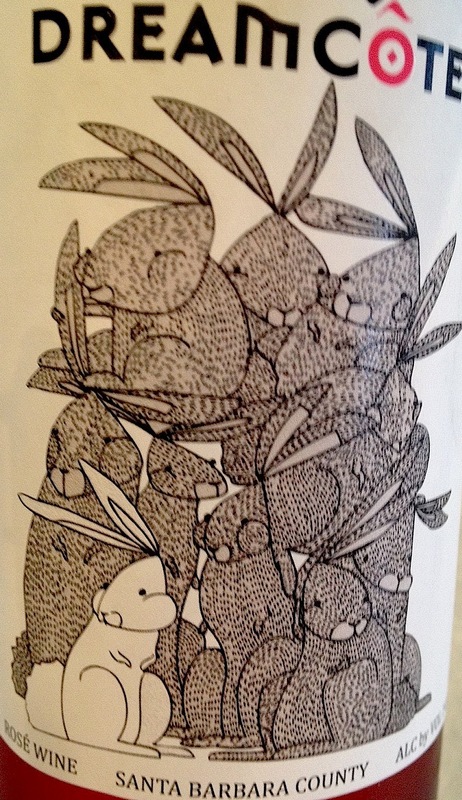 Take the 2012 Santa Barbara County Rosé: The label features a stack of rabbits — many, many rabbits. It’s a tongue-in-cheek ode to Zotovich, who raises them. In addition to rosé and pinot noir, Dreamcôte’s current releases are a 2012 Riesling, Camp 4 Vineyards; 2012 Chenin Blanc, Johnson Vineyard, Clarksburg; a 2012 Zinfandel, from Launchland Home Ranch Vineyard, Lodi; and a 2012 late harvest white wine. 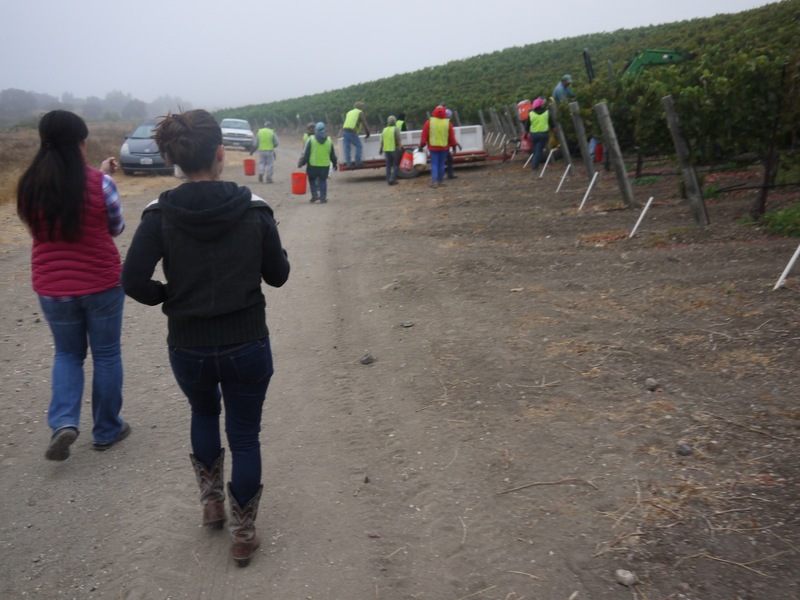 Back at McGinley Aug. 29, the harvest crew wasted no time snipping grapes from vines and dumping them by the bucket into picking bins atop a trailer. Both Clifford and Zotovich jumped in, bracing themselves against a bin to sort, separating the clusters from grape leaves or dried shoot tendrils and the occasional earwig or tiny spider. 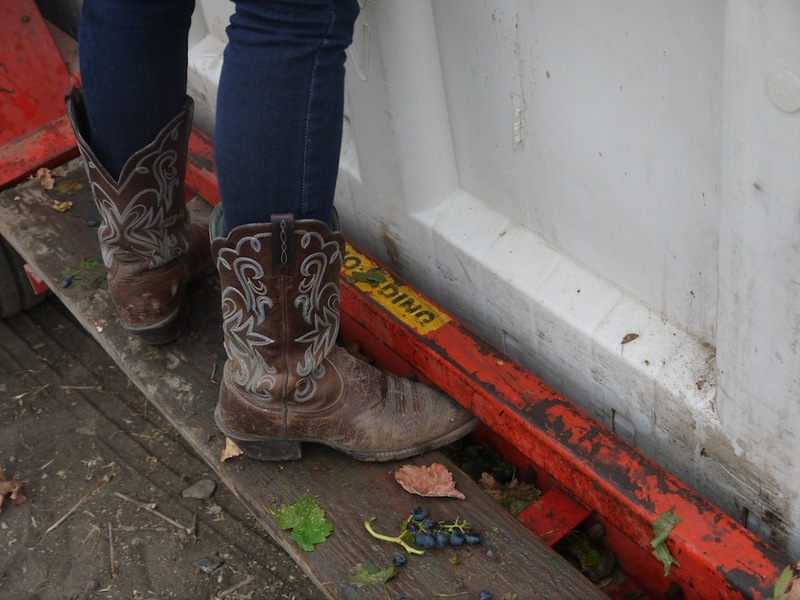 Less than an hour later, the crew had filled three picking bins full of syrah grapes from Block 5L, which weighed in at 3,084 pounds. Clifford, Zotovich and I trailed the Coastal Vineyard Care Associates’ flatbed truck to Terravant, where the grapes would be unloaded and the two could begin processing. 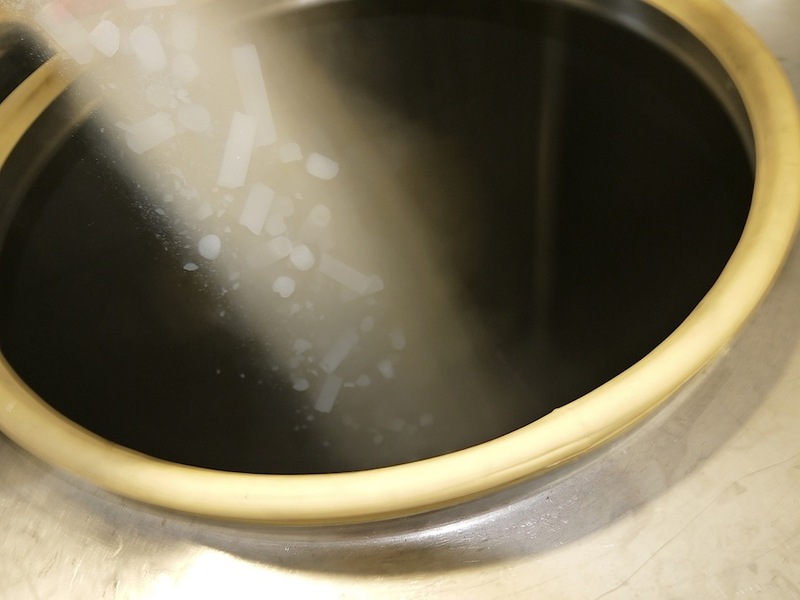 Once a forklift and driver, dry ice, shovels, equipment and a pair of extra hands were at the ready, Clifford and Zotovich directed the dumping of whole clusters straight from the bins into the tank for a 14-day cold soak. 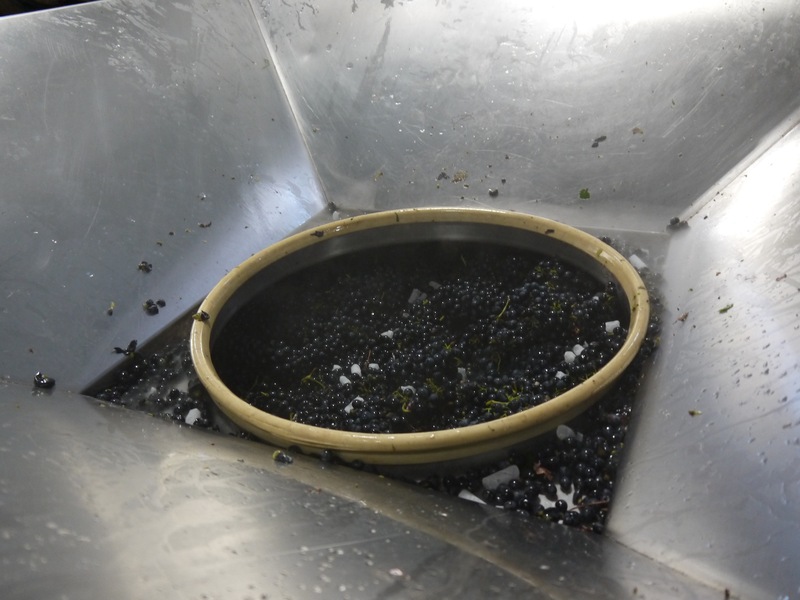 Mixed in with the grapes were layers of dry ice, added via buckets. With syrah in the tank, she and Clifford are looking ahead to their next pick, likely from Zaca Mesa or Camp 4 vineyards.